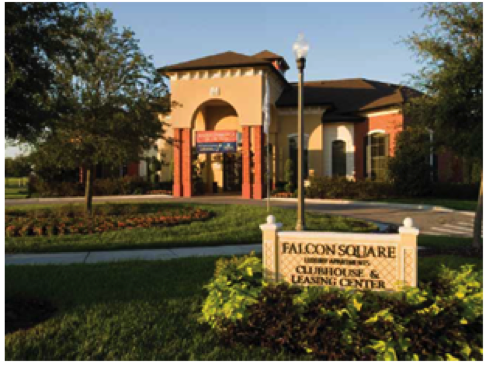 On July 18th, Venterra purchased Falcon Square, their first property in the Orlando market! The community is only 3 miles from the entrance to Disney World and Falcon Square’s submarket is one of the fastest growing areas in Orlando. Falcon Square is a 379-unit apartment community built in 2008 with concrete construction, an average unit size of 1,122 square feet and 43 detached garages. The property is nestled amongst single family houses and townhomes giving it a community feel as opposed to being a traditional apartment complex. Falcon Square also has unique features such as separate showers and tubs, large kitchens, tray ceilings in the kitchen, and very spacious units. Residents have access to amenities such as the clubhouse, resort–style pool, fitness center, basketball courts, business center, playground, dog park, and tennis courts.